I am really excited to bring you this fabulous giveaway! 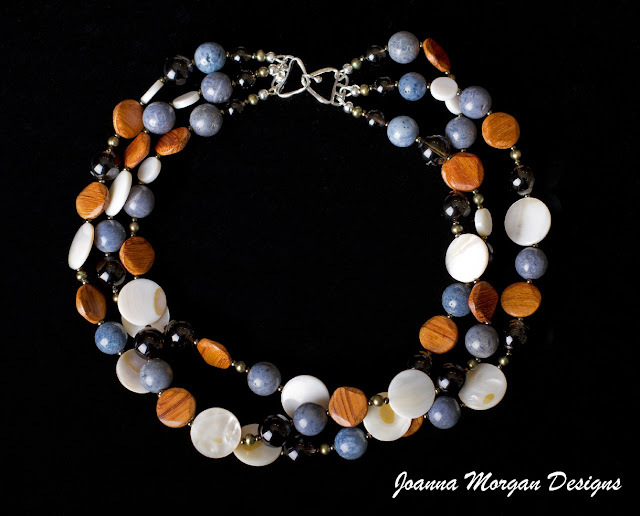 Joanna Morgan Designs is a wonderful company, where the jewelry is made by hand in the USA. Joanna is based in Seattle, Washington and loves fashion. Joanna Morgan is a Seattle based jewelry designer, a long-time fashion aficionado, and an avid reader of “Vogue”. Having grown up in Poland and influenced by a family with eclectic interests, Joanna has always been fascinated by art and design. Although she had been creating jewelry for several years, she decided to launch her first collection in early 2010 after she left yet another party having sold her earrings to a friend who loved them, and bought them on the spot. From the start Joanna focused on creating jewelry accessories that are not only stylish and unique, but made with quality materials. Her favorites are semi precious stones, fine and sterling silver, pearls, and wood. She seeks out and collects antique and vintage elements, which she often incorporates into her designs to make one of a kind jewelry pieces. Joanna's inspiration comes from the beauty of the gems she uses, their texture and colors, her love of nature and fine art, and being influenced by different cultures. Although Joanna follows fashion trends and pays attention to what’s current, her main goal is to offer women versatile and stylish pieces that can be worn every day and be a part of a modern wardrobe. the pieces are very original, I love having something no one else has! I love this bracelet so much! It is so dainty looking, and the colors will go with just about any color outfit. It can be dressed up or down very easy. Since we have Mother's Day coming up, I really feel Joanna's jewelry would make an amazing gift for any mom out there. Her designs appeal to those of any age and I think everything is really beautiful. I love the fact it is all made by hand and original designs. 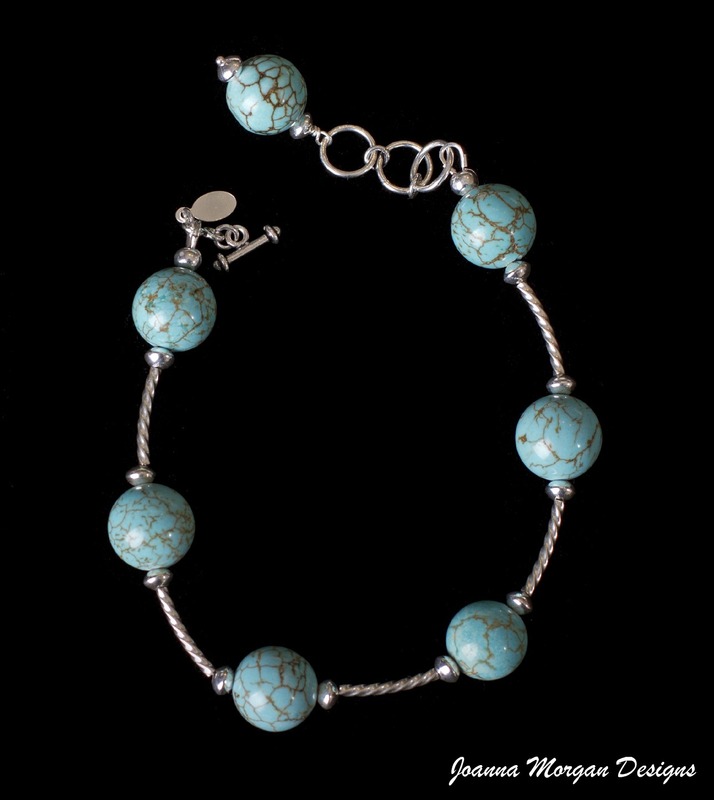 A simple and modern bracelet designed with blue and white magnesite and sterling silver. Versatile and stylish, great for layering, it is one of our most popular designs. Be a Google Friend Connect follower OR an Email Subscriber via Feedburner....leave a comment with your favorite piece of jewelry from Joanna's designs HERE. 2. Follow Joanna Morgan Designs on TWITTER and tweet this giveaway & leave a comment saying you did. 5. 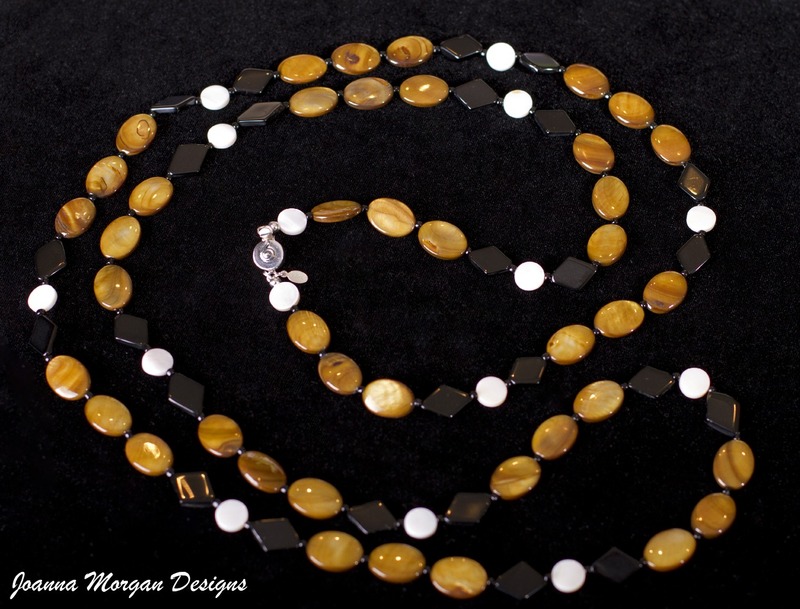 “Follow Joanna Morgan Designs on Pinterest – leave a comment you did or already are a follower. I need to be able to contact you should you be the lucky winner, so please be sure I can email you or I will need to choose another winner. If you leave a comment as anonymous, be sure your email is in the comment as well. Details: This giveaway is open to USA Residents and will remain open until March 12th at 11:59 p.m. EST. Any comments left after this time will not be counted. The winner will be selected randomly and will be notified via email and will have 48 hours to claim their prize. I have not received any compensation for posting this content and I have no material connection to the brands, topics and/or products that are mentioned herein. Joanna Morgan Designs will be providing this giveaway to the winner. My opinions are 100% my own. Gorgeous!!! And I love that the pieces have this uniqueness to them, I couldn't confuse them with some other designer or brand. I follow you on Google Friend Connect as EV, and my favorite piece is On The Rocks earrings. Cute name, too...makes me think of good scotch or Bailey's. Forgot to say who I follow in my previous post lol! I follow Joanna Morgan Designs and NYC, Style and a little Cannoli on Twitter as @LifesDeepcolors and tweeted about the giveaway. Thank you for offering this giveaway. What a beautiful collection! I subscribed via Feedburner. I especially like the Pearl Clusters necklaces and the White and Blue long necklace. Thanks so much for this giveaway! :) I'm following you on GFC as Elisabeth G. I really like the Romance Noir Lemon Smoky Quartz earrings! I'm now following Joanna on Pinterest! I love the Romance Noir & Fools Gold Bracelet! So chic! What a great giveaway! I love the Romance Noir and Fool's Gold bracelet. I follow by GFC and love the High NLow Earrings! Following you on pinterest under Debra Lee! Following Joanna Morgan Designs on Pinterest under Debra Lee! Great giveaway! My favorite piece just happens to be the one you are giving away. I like the matching earrings as well. I subscribe to your emails and follow you on Twitter and Pinterest!